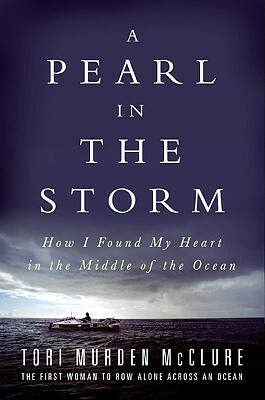 A Pearl in the Storm: How I Found My Heart in the Middle of the Ocean by Tori Murden McClure. Grades 9+ [adult, with high crossover appeal]. Collins [an imprint of HarperCollins], 2009. 286 pages. Review copy provided by my local library. So, Tori Murden McClure was the first woman to row solo across the Atlantic. Yeah. She rowed. Solo. Across the Atlantic Ocean. As in, a rowboat. 3,333 miles. By herself. Through storms. With sharks and whales and jellyfish. She is pretty awesome. In her memoir, A Pearl in the Storm, Tori intersperses the play-by-play of her heroic journey with snippets of the life that led her to the oars. For Tori, the journey was about defeating helplessness. Or, at least it started out that way. But here's the thing about helplessness: you can't defeat it. We're human. We're all going to be helpless sometimes. And so Tori's journey became about accepting helplessness, about living with it and not letting it control her. The riveting adventure is only one part of the book's teen appeal. Tori writes in such a way that she puts the reader right into the story. When I was reading this book, I was no longer sitting in my armchair with my cat purring contentedly on my lap. I was curled up in a tiny boat cabin as a FREAKING HURRICANE tossed me head over heels. I was laying with my ear pressed to the side of the boat, listening to the clicks and moans of whales far below. I was staring up at billions of stars as I drifted on the water with no land in sight*. So, yes, riveting adventure and the kind of writing that lets the reader feel it. But I think a bigger part of its teen appeal is the entire concept of Tori's journey. I ask you: what teen hasn't felt like she was adrift in the ocean during a storm? Here's the other thing: Tori didn't make it on her first attempt. After battling through Hurricane Danielle in the North Atlantic and facing yet another oncoming storm, her battered body had had enough and she called for a rescue. But with help from some devoted friends, Tori realized that falling down doesn't mean you've failed. You've only failed when you don't get back up. She got back up and on her second attempt, she made it. And that's something that everyone needs to hear now and again. It's an inspirational story that doesn't read like an inspirational story. It's not hokey, it's not didactic. Instead, it's witty and thoughtful. I laughed out loud and was moved to tears. I have to admit that the first 30 pages or so didn't capture me, BUT push through that and you'll get to the good stuff. After the very beginning part, I was on the edge of my seat the whole time. I think it'll appeal to teens who've enjoyed books like Jon Krakauer's Into Thin Air, Sebastian Junger's The Perfect Storm, or Jerri Nielsen's Ice Bound. A Pearl in the Storm is on shelves now! Sidenote: Tori Murden McClure is speaking at my library in April! She's the keynote speaker for our ILF District 6 Conference and after reading her book, I seriously can't wait to meet her. Hey, it's Nonfiction Monday! Head over to Great Kids Books for the roundup! * During the time I was reading this book, I actually had a dream about laying down and seeing all those stars above my head. Probably the real thing would surpass my wildest imagination.